You’ve invested in the best sod on the market. Maintain it with products that will keep your grass looking as good as it did when you first planted it. Apply BioGrass Suståne® when temperatures are fairly cool and your lawn is dry. For best results, apply fertilizer with a broadcast-spreader rather than a drop spreader. Please read your spreader manual carefully so you do not burn your lawn. Typically the setting should be at 5 or 6. This is for a medium or average application. use a higher setting if needed. 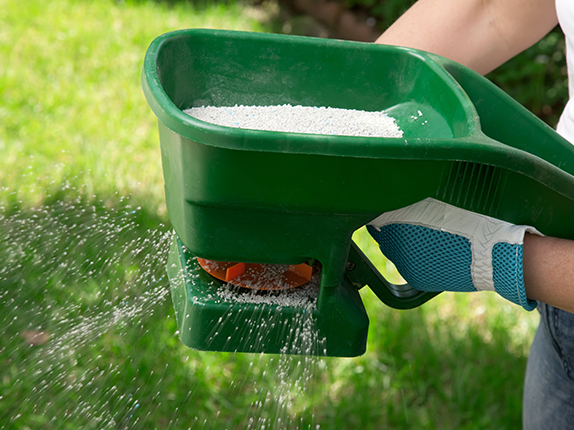 Apply Sustane fertilizer to your lawn and garden three times per year. Use the holidays as a memory guide (i.e. Easter, 4th of July and Halloween for a winterizer). New BioGrass sod does best with all-natural Suståne 4-6-4 fertilizer underneath the sod. Spread the fertilizer on the bare dirt if possible. If not, spread it on the grass. Water the ground immediately after applying. BioGrass 18-1-8+Fe is a balanced, naturally based fertilizer that works any time of year. IMPORTANT NOTE: Because this fertilizer contains 1% iron, you must sweep it off all concrete and stone surfaces near fertilized ground before watering. Otherwise, permanent rust stains will appear. Water all fertilized areas immediately following fertilization. Begin a normal watering schedule after that. Suståne 4-6-4 fertilizer comes in a 50-lb. bag that covers 2,000 square feet. Suståne 18-1-8+Fe comes in a 50-lb. bag that covers 8,000 square feet.